Jane Blundell Artist: Colour exploration - Super bright 6 colour palettes - updated. Colour exploration - Super bright 6 colour palettes - updated. Once again I have been exploring palettes with no earth colours but this time using neutralising pairs. Here are a couple of gorgeous bright palettes to consider. The first is based on my gorgeous bright quartet, posted here, that contains DS Hansa Yellow Medium, DS Transparent Pyrrol Orange, S Purple Magenta and DS Phthalo Blue RS. The Red Shade of Phthalo Blue neutralises completely with Transparent Pyrrol Orange to create a black. Here in this set I have switched to Phthalo Blue GS. I have added Phthalo Green YS PG36 which neutralises purple magenta to a grey, though not a black. I have also added Carbazole Violet which neutralises Hansa Yellow Medium to create yellow earth hues and raw umber hues. So the palette contains one of each primary and one of each secondary in neutralising pairs. They are quite neatly arranged around the colour wheel, though not completely evenly. 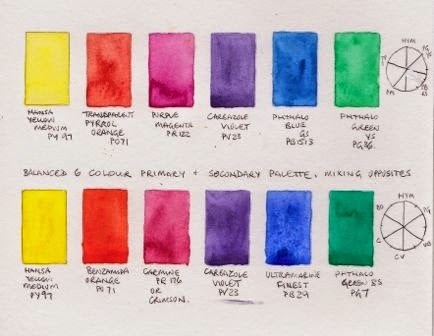 All are Daniel Smith watercolours except the Schmincke Purple Magenta. Pyrrol Orange PO71 is now called Translucent Orange and the color looks as juicy as can be. Daniel Smith now carries PO71 but its redder looking and not near as beautiful. Renee the differences between brands using the same pigment is really quite confusing. I note I did not include the brand which I will fix. The Transparent Pyrrol Orange mentioned above is Daniel Smith. PO71 is found in W&N Transparent Orange, Schmincke Translucent Orange and QoR Transparent Orange. These are all gorgeous mid oranges. It is also found in DS Transparent Pyrrol Orange which is a completely different warm red-orange rather than a mid orange. (I use it as my warm red!) It is closer in hue to SQ Vermilion made with PO73. You can see all these oranges compared here - http://www.janeblundellart.com/painted-watercolour-swatches.html - in the single pigment oranges section.